Your performance at the VMAs was amazing… But what about the swan scene, my FAVORITE moment in Applause?!?!! I’m SO disappointed. And angry. Missed the show so I’ll have to look up what she did. No es tranquilizante la imágen Cha. Y gracias por tu comentario por supuesto!! Is that Lady Gaga? I didn’t watch the VMA’s either…I think it was on live where I was..
No, that’s Pete Doherty. AHah just kidding. Her performance was really good. She can sing! No idea who that is, but I like your sketch! 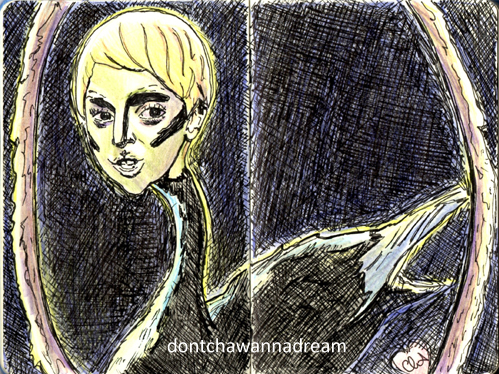 Okay, Lady Gaga as a swan. . .
Yeah, nice sketch! No idea what VMAs is but, anyway, lovely sketch! Ohh I like this! A little creepy, but in that awesome Lady Gaga way! I missed the show, too… but I suspect I’d find your work more entertaining, anyway! Very cool! Thanks a lot for the likes and the comment!